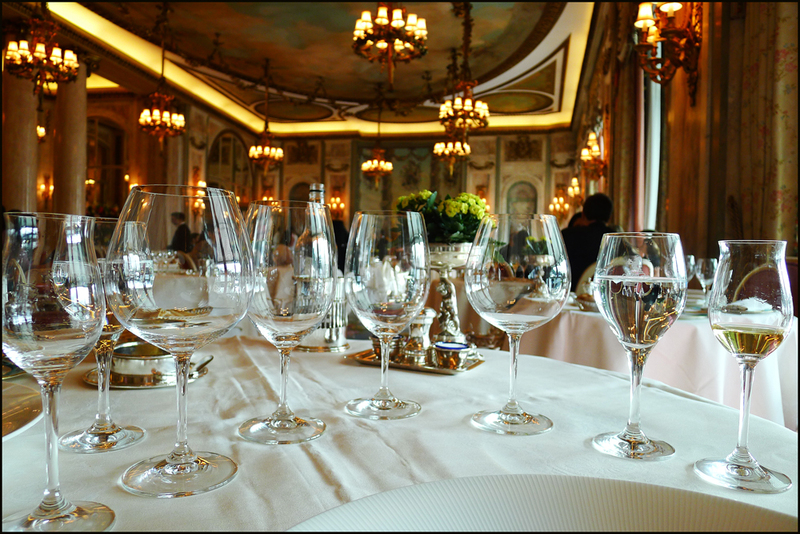 The finest foods in the land matched up perfectly with amazing wines and served up in one of the Worlds most exclusive hotels by a highly skilled team of professionals……and in the background…. James Bond , surely a match created in the heavens ? Well for us guys it was.It was a dream ending to another of the dodgy duos trips to London….”Sunday lunch in the Ritz hotel”. 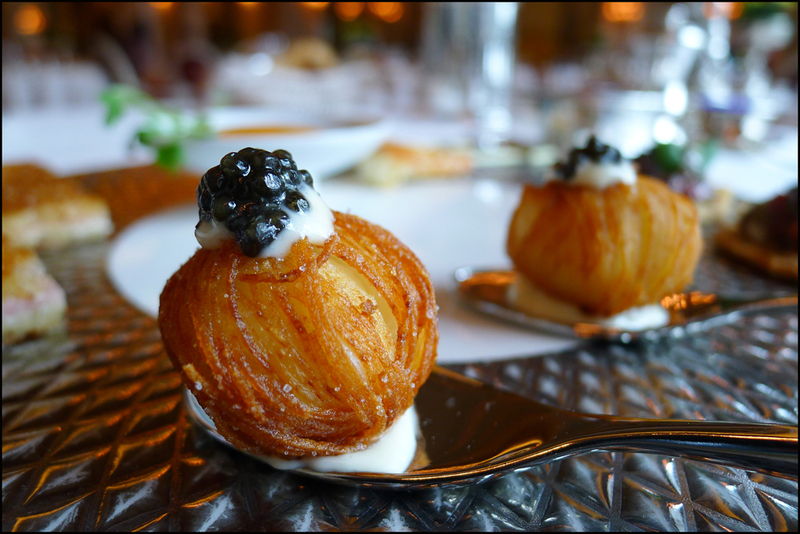 The food served up at The Ritz is my type of cuisine in a nutshell , Classic old school cooking but modernised to suit the current trends.Head chef Adam smith ( follow on Twitter ) runs the Ritz kitchens under the long serving executive chef John Williams. 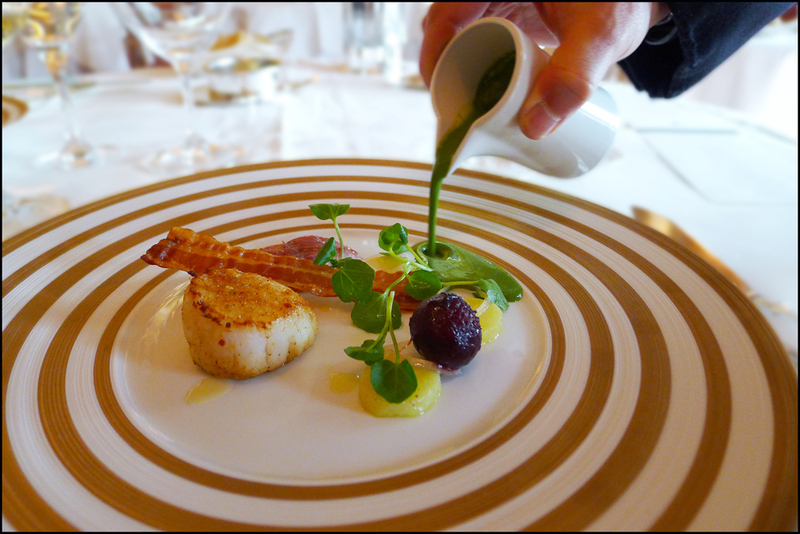 Adam recommended that we skip the set Sunday lunch and go for the Sonata menu instead…how could we refuse ? We had already eaten the Alyn Williams 18 course on the friday , 10 courses at Alain Ducasse on the Saturday so finishing off with the 10 course Sonata tasting menu at Tha Ritz would put our weekend tally at 38 courses….a couple of pastry shops , Macarons and a Big Mc…. Yeah no problem – bring it on. So it was The Ritz visit number 2. Our first lunch there in 2011 was a total treat so i had a feeling that this one was going to be even better. 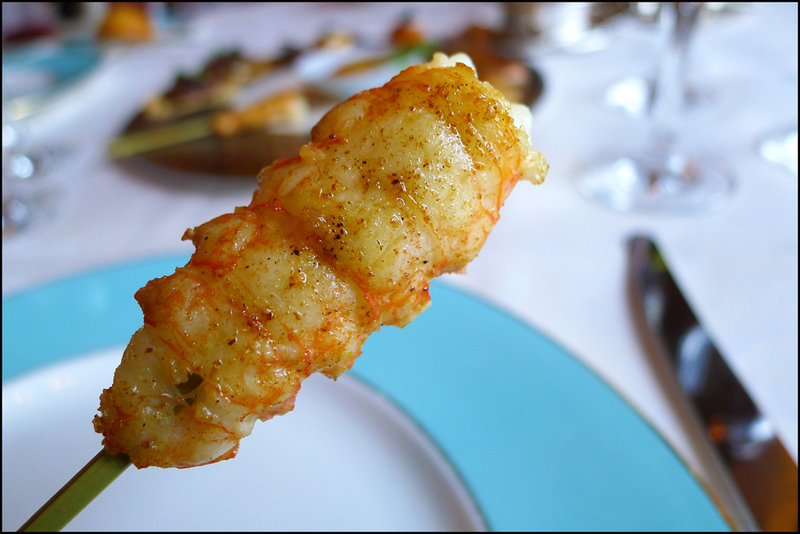 When deciding what to eat then there`s a number of choices for the Ritz diner. The cheapest way to experience the place would definitely be the excellent value classic Sunday lunch priced at £45.You`ll get a 3 course meal with a little pre-starter and a pre dessert treat inclusive. An extra £5 will get you coffee, tea and a taster of 6 Ritz petits fours. Service is also included in the price. There`s a few choices when chosing each course and during my 2 visits they`ve had the Sunday roast Beef on , carved expertly at the table with all the accompaniments. 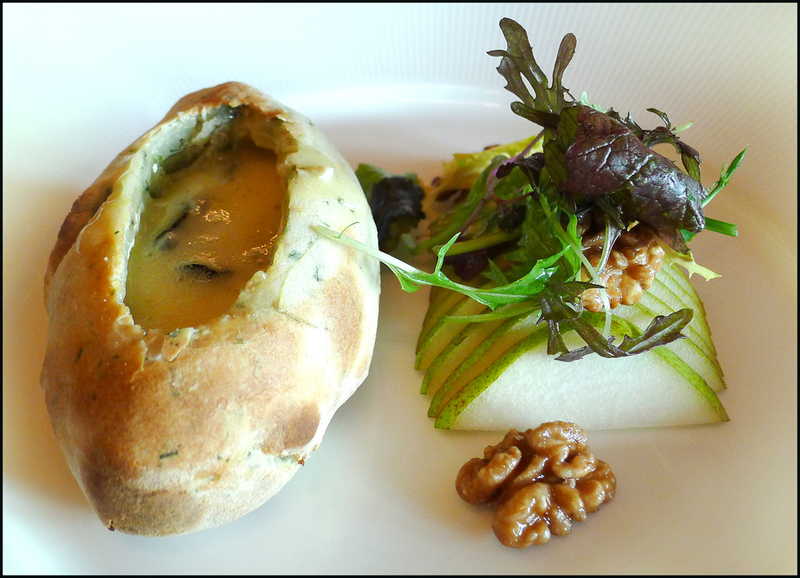 Another option is the a la carte with several choices on each course which are all individually priced. 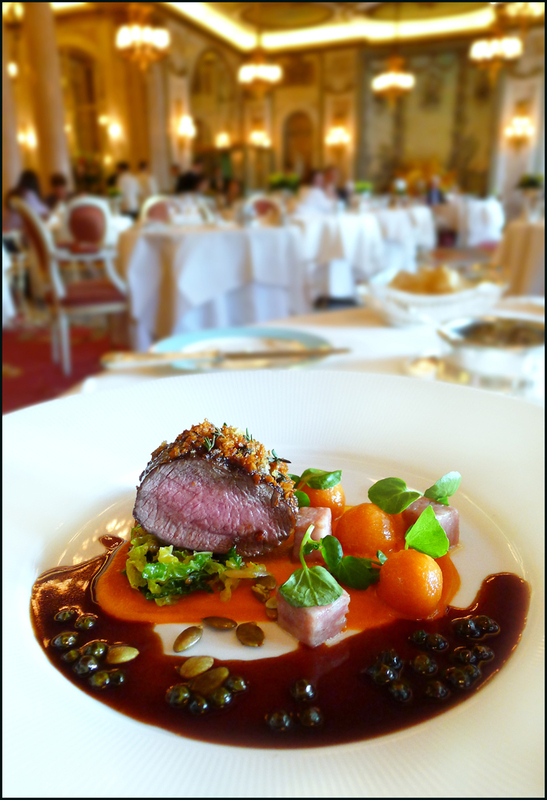 The Sonata or tasting menu is priced at £99 and this one showcases the best of the Ritz and changes with the seasons. 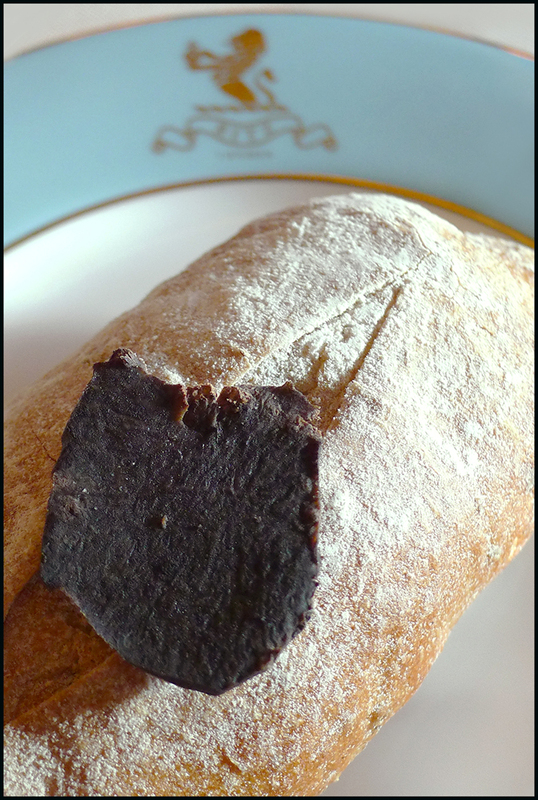 There was however another choice during our visit….The Truffle menu – Ohhhhhh dearie me. 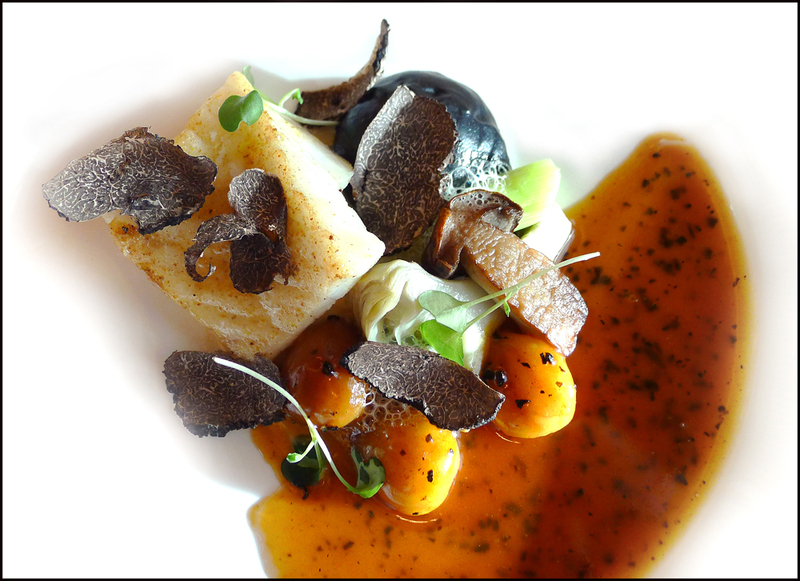 Starters , fish , meat and puds…All incorporating the Black Truffle – Satan get thee behind me. The menus were offered for our perusal but swiftly whisked away under chef Adams orders. Obviously not wanting to give the game away and adding excitement and surprise to what we were about to eat , along with lots of Ooos …Aaaaahs. And so the meal began……. Halibut Dauphine , Smoked Oyster mayonnaise with Caviar. 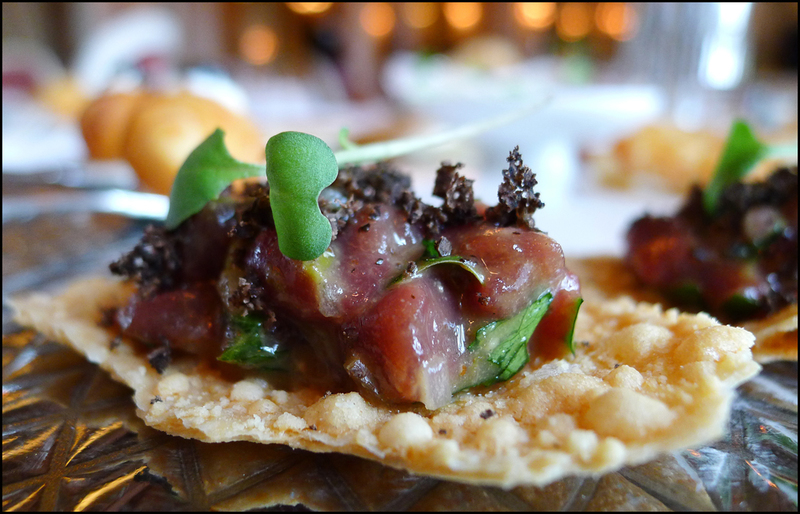 Venison Tartare , Parmesan bread and Black Truffle. Roasted Langoustine , Sauce Marie. 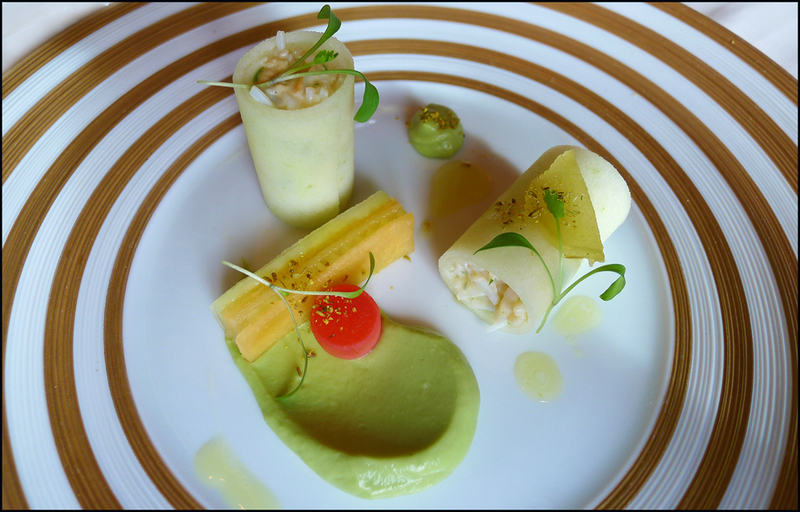 Dressed Devon Crab roll , Avocado , spiced apple puree , confit ginger, Charentais Melon. 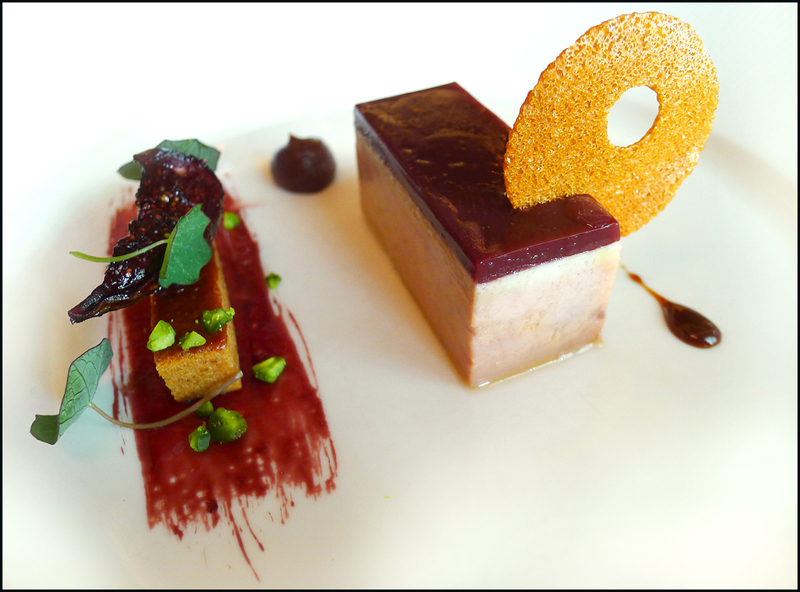 Terrine of Goose liver , Port glazed Spiced Fig , Gingerbread and Marsala jelly. 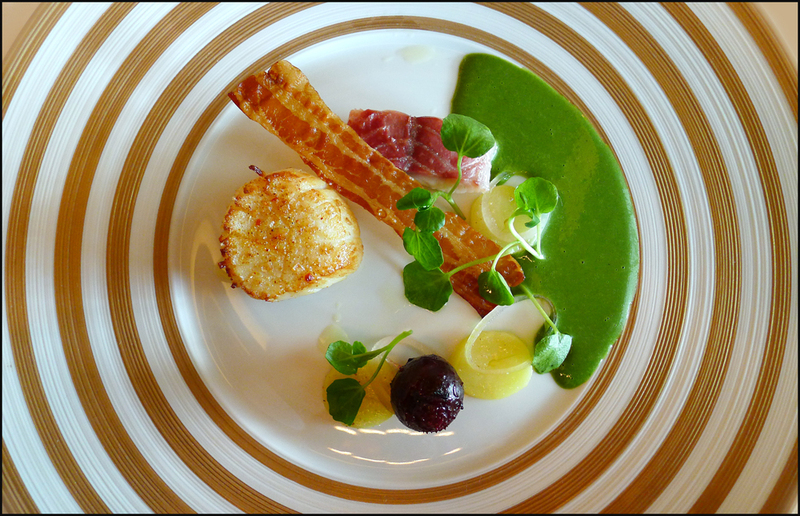 Seared Scottish Scallop , Smoked Eel , Bacon , pickled Shallots and Watercress. Hard to believe….all of these glasses actually got filled…Sunday lunch…tut tut tut. 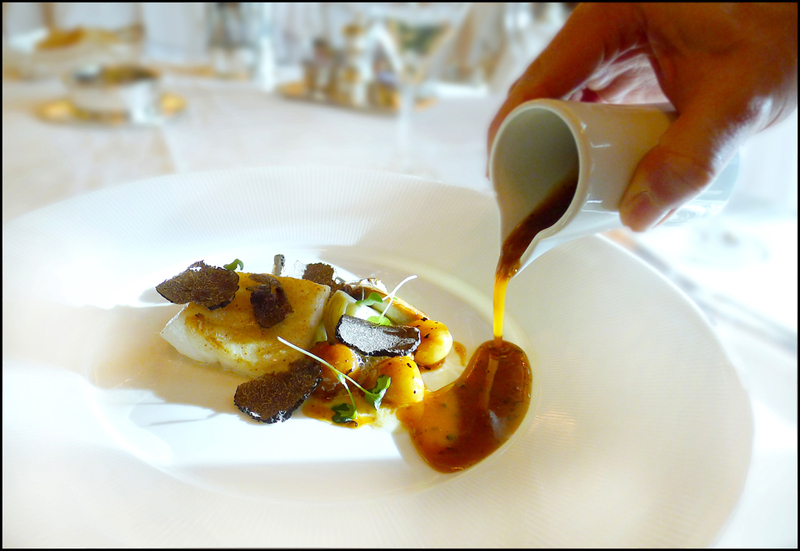 Braised Cornish Turbot , Chestnuts ,Artichokes , Cep puree and Truffle. 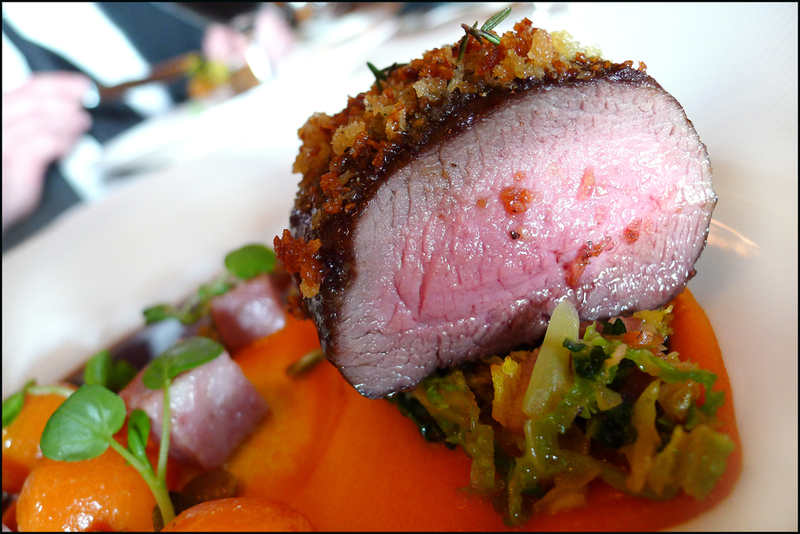 Peppered Venison loin , Smoked sausage , Pumpkin and cabbage. I think that around this point in the meal we stopped to gather thought…the food was absolutely top of the tree, amazing luxury ingredients cooked to perfection.The wines and champagne were matched to a tee….wouldn`t we just cap it all off if the pianist could play James bond themes ? I didn`t hesitate for a second and on the way to the gents i passed a quiet word “Any chance of some 007 tunes please ? ” The pianist simply answered “Name that tune” and on my return i was greeted by “From Russia with love” followed by “You only live twice”…. Mr Bond…..wow , it was definitely our day. The Tunworth cheese course arrived next and was definitely the highlight of the meal for both of us.It arrived ceremoniously at our table wheeled in on a trolley with a little entourage of Ritz waiters by its side.What looked like small bread rolls was infact a herbed salt crust pastry case baked until it resembled bread fresh out of the oven . 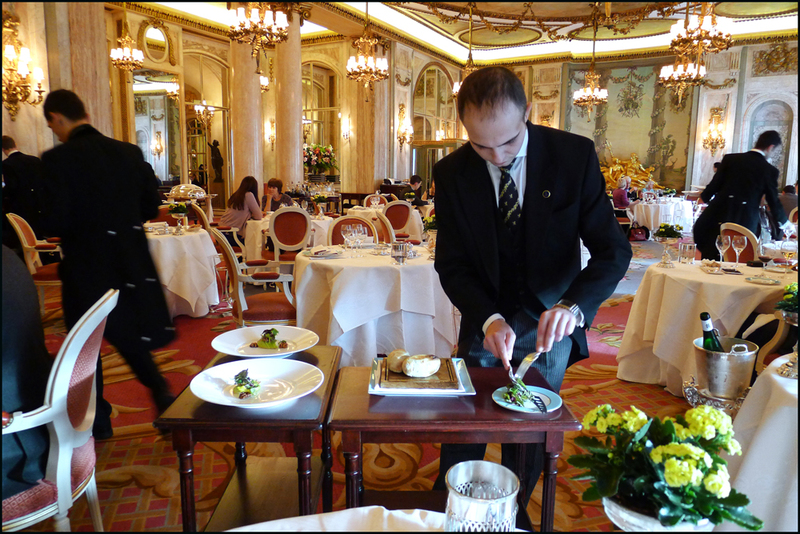 It was presented to us just like this and then set out on to the trolley where a small lid was expertly and delicately carved out of the top of the roll by our Maitre`d. 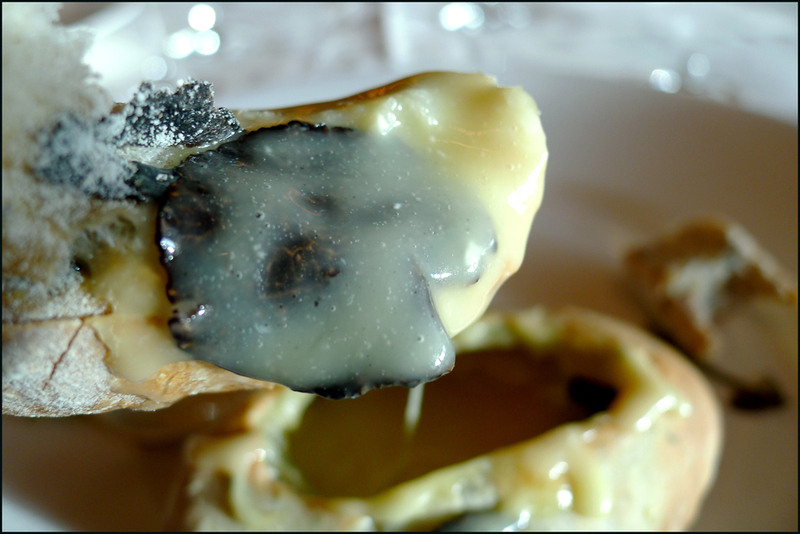 We were still non the wiser until it was put in front of us and the lid was lifted open.The most beautiful aroma filled the restaurant… Truffle and warm scented cheese wafted up and into the air around us.I peered down and i was greeted by a wonderful sight of Black and yellow…Truffles and melted Tunworth cheese…Liquid gold and black diamonds of the Perigord. 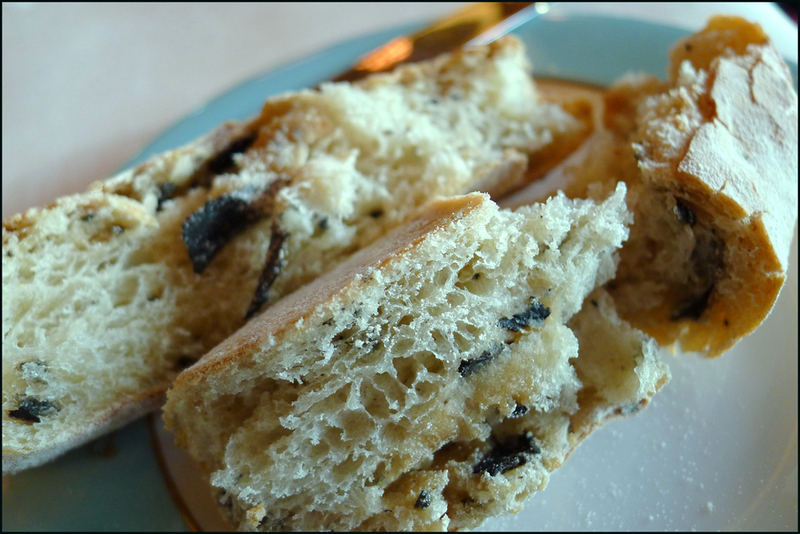 I cracked open the freshly baked hot bread roll and once again the smell hit me clean in the face…Truffles “again”….lots of them studded into the bread…..The poshest soldiers in the world….Oh and what a treat. 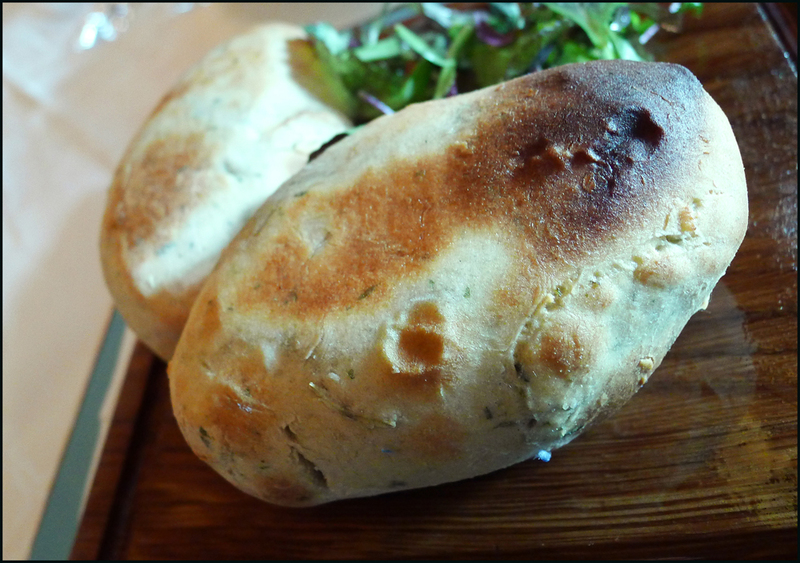 Here`s a little look at what exactly comes out of the salt bread….and i have to say at £28 for this course alone it has to be worth every penny just for the taste experience. Lime and Vanilla sorbet , poached Rhubarb , Muesli. 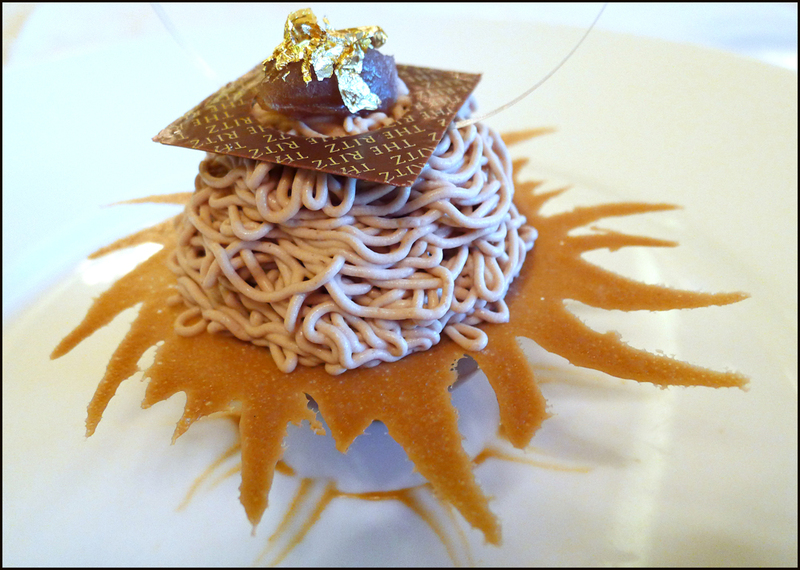 Mont Blanc , Caramelised Pear and Clementine sorbet inside a milk chocolate dome , Rum baba , Marron glace , Chestnut Chantilly cream. 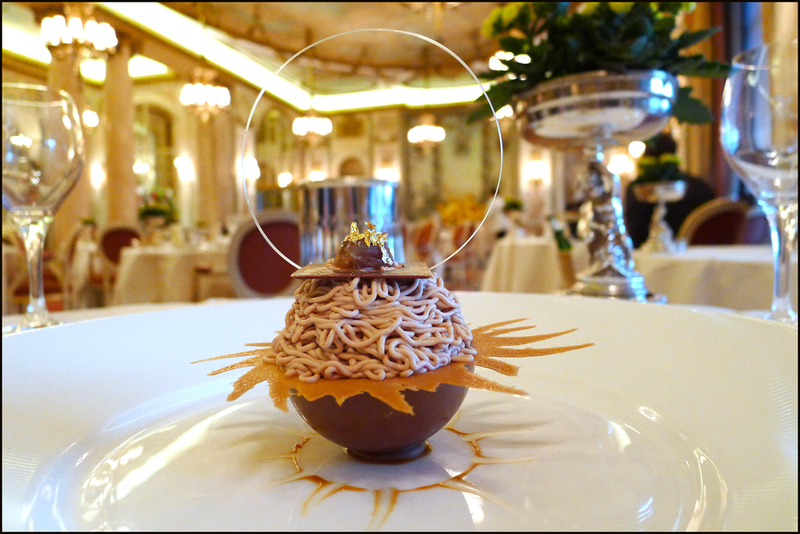 So from the bottom – Caramel sauce , Milk chocolate dome containing the caramelised pear pieces and a Clementine sorbet.Topped with a tuille biscuit.Rum baba is placed onto the biscuit and then the Chestnut chantilly cream is piped around.A chocolate square is placed on the top followed by the Marrons glace ( candied chestnut ) and finished with edible Gold and a beautifully moulded and very fragile caramel decoration…. Desserts just dont come any better than this world class piece. 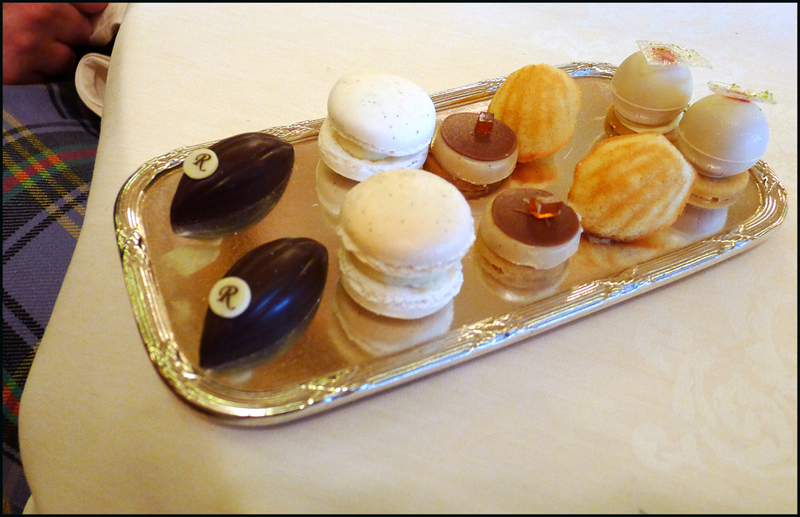 The Ritz coffee and Petits fours. 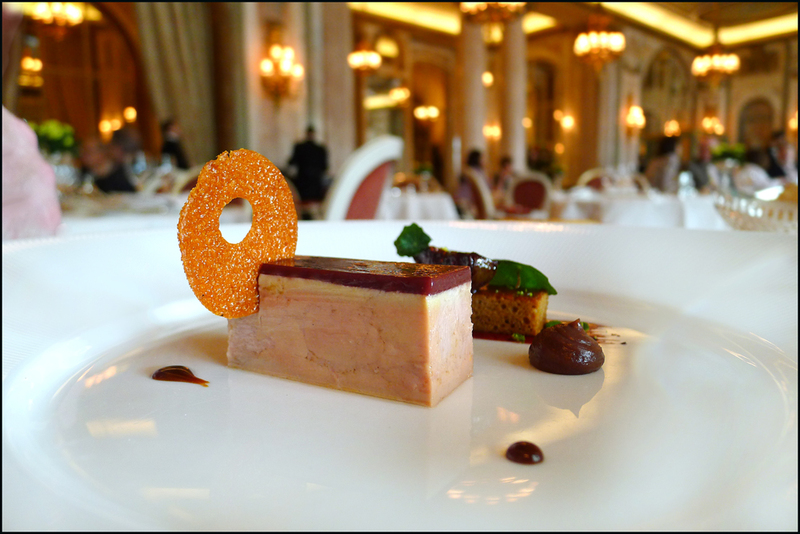 A trip into the kitchens of The Ritz. 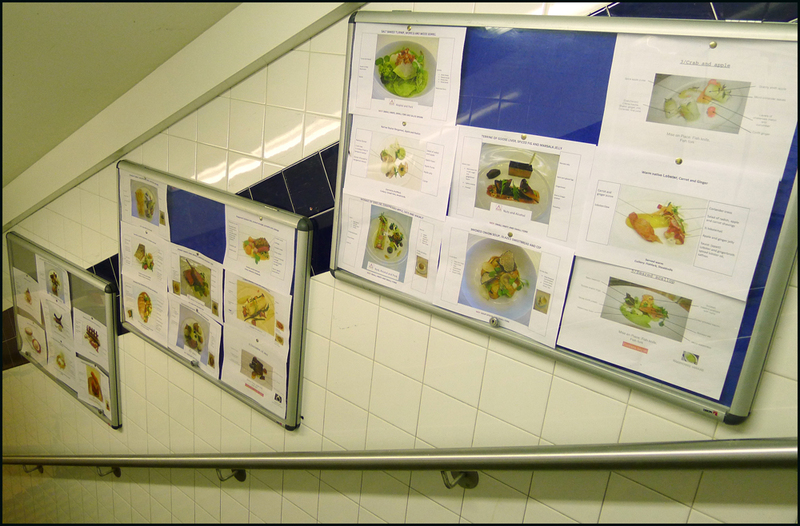 On the boards, each course of the menu is photographed and detailed exactly how it is to be presented. Each and every component of the dish is described for the staff to learn in detail. And just to finish off the day….. The Laird, my trusty minder….always prepared to defend me to the death poses with a strange gathering of tourists outside his second home,The grand palace of Buckingham…note that even celebrity rapper “Tiny Tempa” muscled in for a pic with “The Laird”,complete with the latest “nite glow” footwear…..and just incase it kicked off -The Jewelled sabre of Northumberland down the sweaty sock lies in wait. The sgian-dubh (Scottish Gaelic pronunciation: [s̪kʲɪnˈt̪uh]; often Anglicised as skean dhu /ˌskiːən ˈduː/) is a small, singled-edged knife (Gaelic sgian) worn as part of traditional Scottish Highland dress along with the kilt. It is worn tucked into the top of the kilt hose with only the upper portion of the hilt visible. 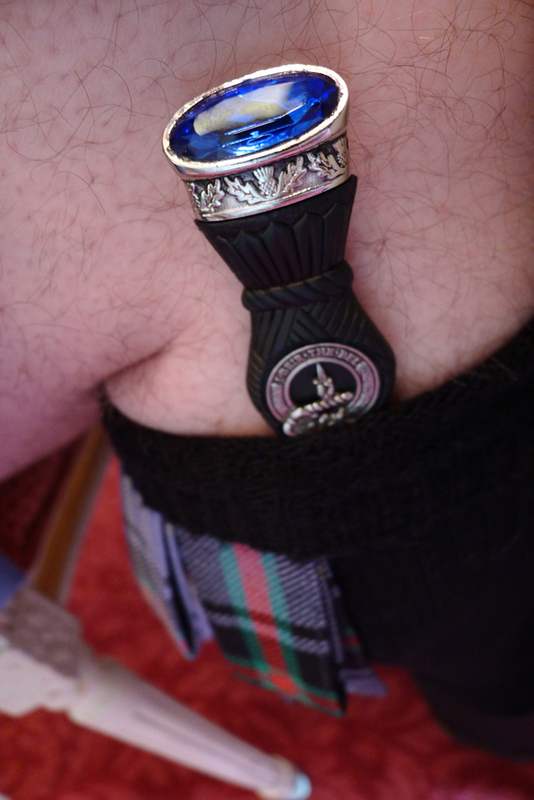 The sgian-dubh is normally worn on the right leg, but can also be worn on the left, depending on whether the wearer dresses to the right or left. So …in a nutshell – Adam done us proud , lovely guy and a fantastic chef with a great future.I haven`t experienced the grand Parisienne 3 star Michelin restaurants yet but this is exactly the picture that i have in my mind what it would be like…and I’d return home a happy man. 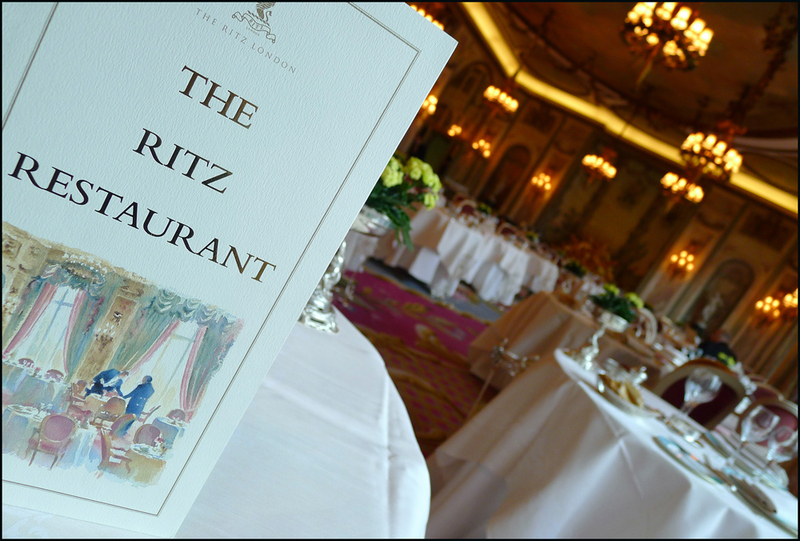 I can`t honestly see us going to London again without eating at the Ritz….It really is that good. The full set of photos from this wonderful meal can be found HERE. Previous Post Alyn Williams at The Westbury Hotel. 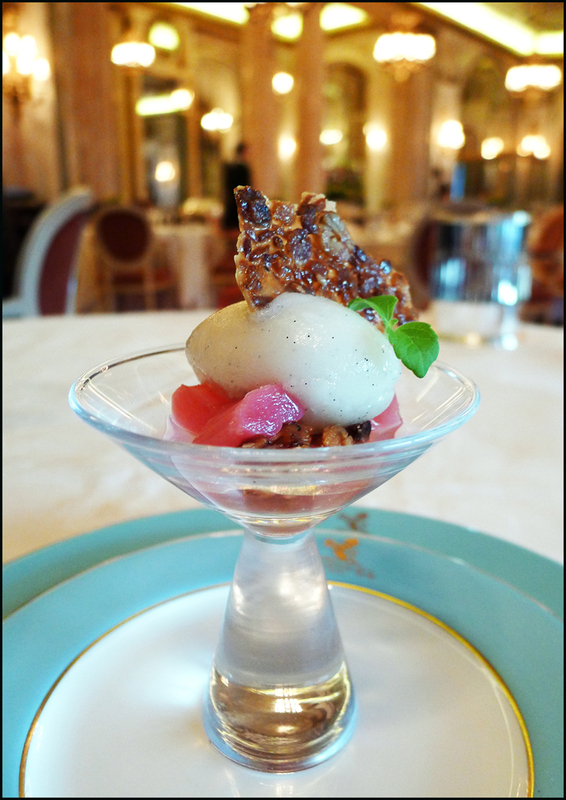 Next Post “Rhubarb” at Prestonfield – another hidden diamond found. Wow! Just… wow. 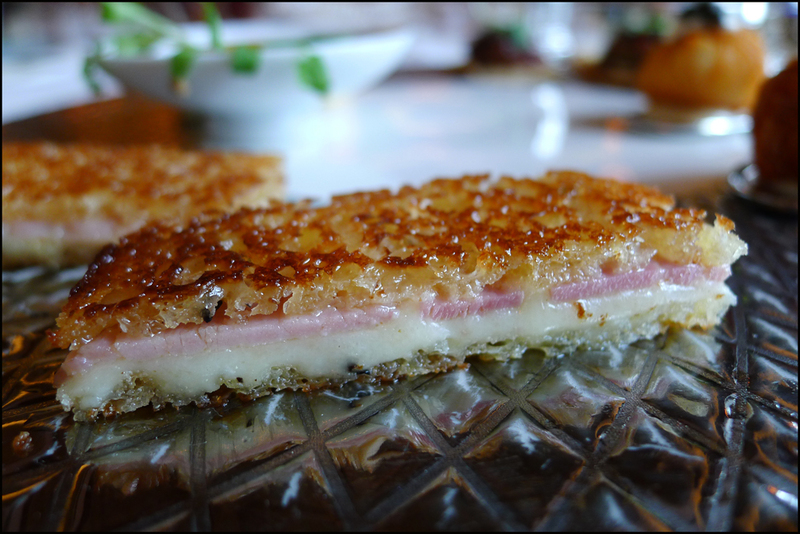 I want to eat so MUCH of that review… I particularly love the sound of that croque monsieur with truffle, the goose liver and that tunworth and truffle with truffle bread. Looks brilliant mate. Thanks for sharing. The more I see of The Ritz the further it moves up my wish list. Absolutely my kind of restaurant. 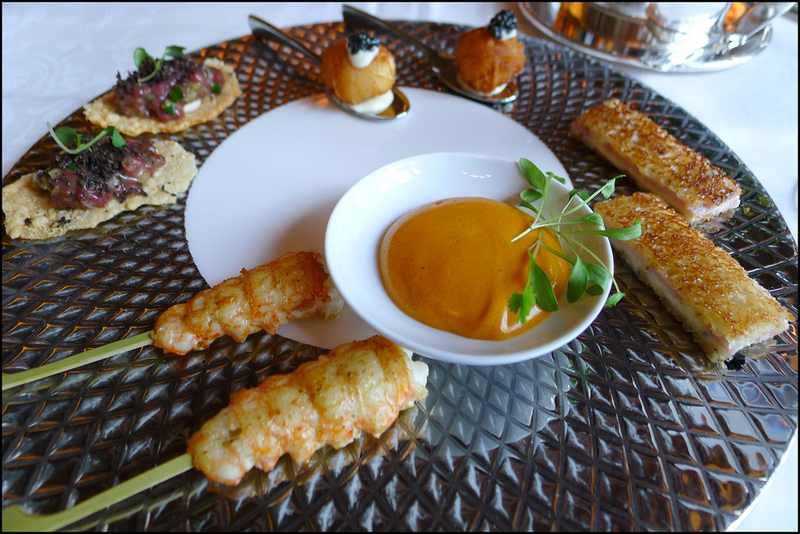 For an amateur blogger, amazing food photography and well worded write up.I`m looking forward already to your next return to the ritz so make sure the photos are as good as this fantastic batch.Your best ever blog post. Looks like the cleanest, most beautifully presented food I have seen in a long time. Booking a table as soon as I can get a baby sitter! That food looked fantastic. I love his combination of flavors: unique, but not over the top. 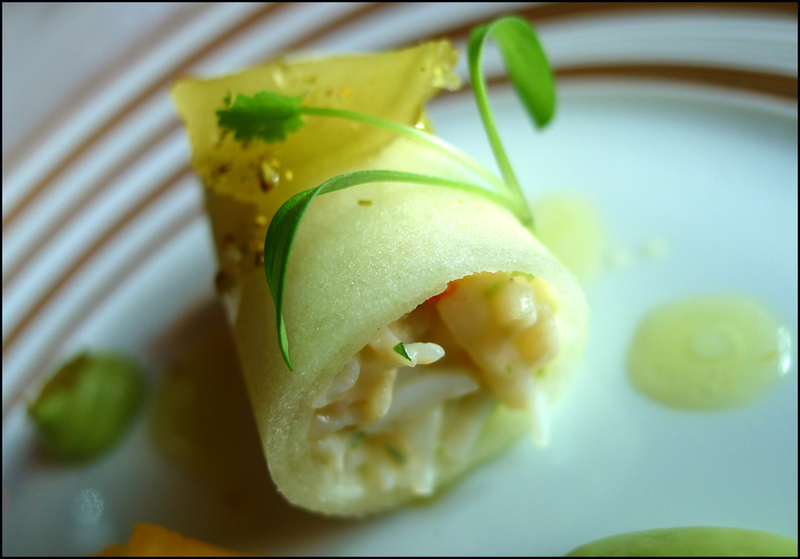 Seems like so many Chefs these days seem to want to (try to) reinvent the wheel. Classy food, fitting the surroundings. I appreciate your reviews as well because I don’t get the feeling that you are a food snob. Refreshing! 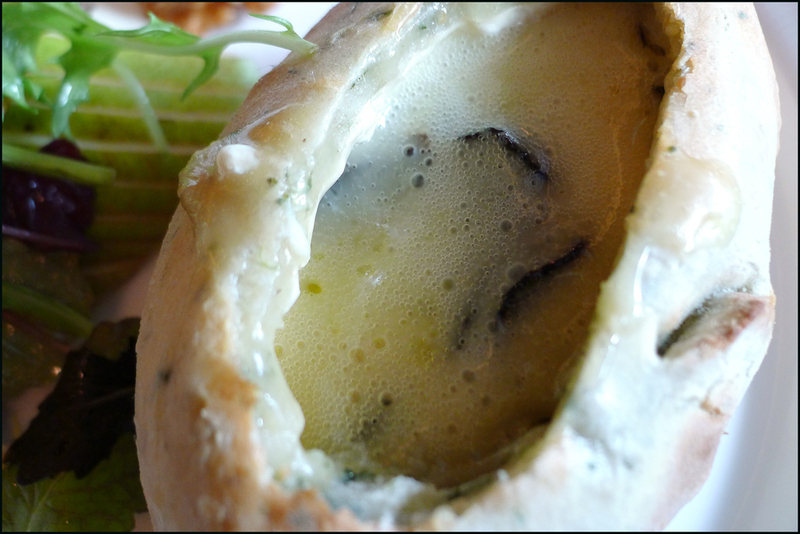 Dear Cumbriafoodie, Do you do a list of recommended restaurants for a trip to London? A friend is coming in a few weeks and I would love to book her reservations but don’t know London cuisine at all. Would it be imposing to ask for recommendations? Sorry Theresa , i havent got a list but i have a few of my favourite meals from last year on here…quite a few London ones in there. Basically you are totally spoiled for choice. wow wow wow that dessert! !